I’ve been spending a lot of time hanging out with my two-year-old granddaughter. One day she got my book out and threw it on the floor. I asked her to put it away before we left the room. Kids crack me up. And none more than those in my own family. This Flashback Friday column was first published in the Chester County Independent June 25, 1998. It ends with a perfect example of how my son Geoff has always challenged me. I’ve never been particularly fond of the phrases, “because I said so” or “because I’m your mother and that’s all you need to know about it.” Rather than instilling a desire to do as the parent says, these words breed anger and frustration. And as I was always quick to remind my parents, God tells fathers “Provoke not your children to wrath…” (Ephesians 6:4a). Okay, probably not a good idea to throw scripture in your father’s face, but hey, I was only in junior high. I’m the type of person who likes to know why. When someone tells me to do something that seems stupid or unreasonable, I grumble and complain, or just refuse to do it – depending on who gave the order. If the reason behind the request is obvious or explained to me, I willingly proceed. I seem to come by this trait honestly. As a result, my dad was always very good about explaining the rules to my sisters and me. If I couldn’t go to a party, it was a lot easier to tell my friends why I couldn’t attend than to just say my tyrannical father wouldn’t let me. Throughout my Bible are DC notations. For each direct command (DC) that God gives, He gives a reason. For example, in Ephesians 6:11, He says, “Put on the whole armour of God, that he may be able to stand against the wiles of the devil.” The direct command is to suit up in God’s armour. The reason is to protect yourself from Satan. Not too different from my command to my daughter to get out of the middle of the road to protect herself from speeding cars. A San Francisco cable car holds 60 people. This blog was viewed about 630 times in 2015. If it were a cable car, it would take about 11 trips to carry that many people. One night this week I was enjoying a beautiful fall evening by sitting on the front porch and reading. 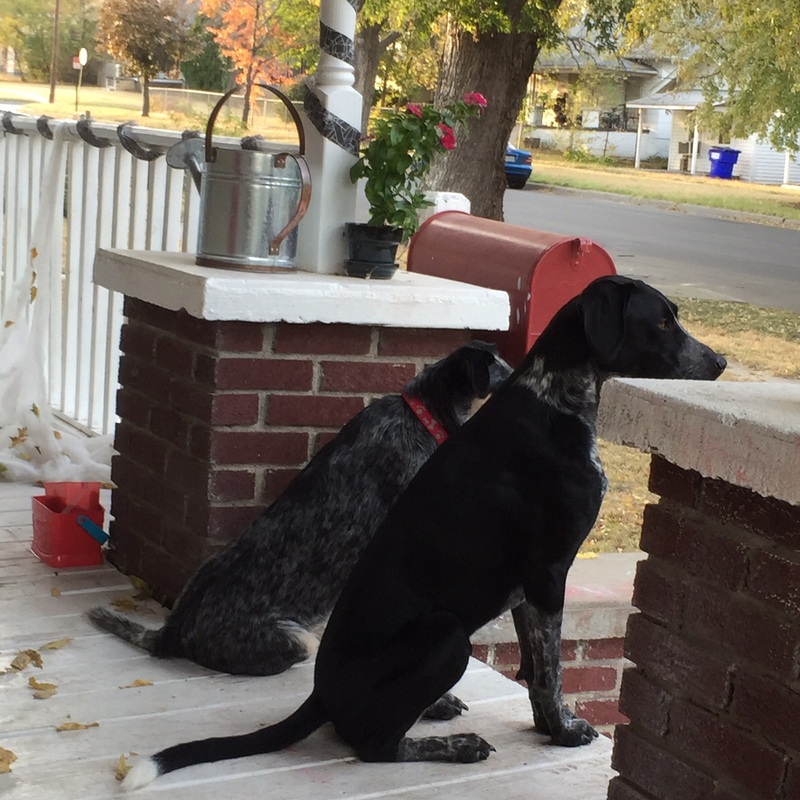 My son and daughter-in-law’s dogs, Stetson and Milo, were being incredibly good, just sitting on the porch watching the after-work traffic pass by. I had set the book aside, watching them and thinking what good dogs they were when suddenly Stetson jumped up and ran right out into the street. He thunked against the side of a red sedan as I jumped up, yelling his name. As quickly as he’d darted out, he was back on the porch standing close to my side. The woman driving the red car pulled over and got out. Are you sure? she asked as she walked around to see if there was any damage to her car. Stetson stood beside me acting like nothing had happened. I was glad nothing serious had! How would I explain to my son that I hadn’t just dinged the running board on his brand new truck? No, this time I’d let his dog get hit by a car. This incident reminded me of another dog and his traffic accident in 1997. Like the other Flashback Friday installments, the proceeding column was first published in the Chester County Independent. We recently drove to Wyoming to visit family. We took our horse trailer since we hadn’t had room for everything when we moved. My husband also decided that we needed to bring our dogs, Haley and Zeuss. They made the 1,300-some miles to my sister’s house in the padlocked horse trailer. After two days in Douglas, we continued the one hour to Casper. We thought no further than we were going, the dogs would be fine in the back of the truck. Zeuss kept standing on the tool box, so halfway to Casper, we pulled off the interstate and put both dogs back in the trailer. Tom didn’t padlock it. During the course of the last few miles we made a sharp turn, crossed a bumpy intersection and stopped at two red lights. While we sat at the second light, I saw the tail of a black dog pass in front of us. Tom realized it was Haley and jumped out of the truck to put her back in the now open trailer. “We lost Zeuss somewhere,” he said. Tom searched for Zeuss unsuccessfully until nearly 2 a.m. First thing Monday he called the pound and was told a dog matching Zeuss’ description had been picked up at 1:30 Sunday morning. Tom took $50 and went to bail Zeuss out. It wasn’t long before he called saying he needed more money. Zeuss had hurt his legs when he jumped out of the trailer and been taken to the vet and given an IV and pain killers. I grumpled about the dog blowing our travel budget, until I was able to put things into perspective. The price we paid for Zeuss’ freedom was pretty paltry compared to the price Jesus Christ paid for ours. God didn’t just give us his son to live among us and teach us His principles. He gave him to die for us. Adam and Eve had done some pretty serious damage to man’s relationship with God. In order to correct the damage, an atonement had to be made. Since man had caused the breach, he would have to span it, but since the break had been made with God, human efforts were not enough. The solution was for God’s holy son to become a man. During the time before Christ’s birth, men made sacrifices of lambs to God. Christ put himself in the position of the lamb, and became the ultimate sacrifice. A vet bill is pretty measly, isn’t it? Today is the first installment of a new feature here at You Do You, Mama. On my About page I mentioned that I used to write a weekly column for the Chester County Independent during the late 1990’s. I was recently reading through some of them and thought it would be fun to dust them off and share them with a new audience. Being mostly Type A and a linear thinker, I originally thought I would post the columns in order of how they were first published. Unfortunately, I don’t have the dates of all of them. So instead, I decided to post columns as they appeal to me. Since I recently drove nine and a half hours from Torrington, WY to Junction City, KS with only one stop in Kearney, NE, I thought the following column would be appropriate. It is generally accepted that women marry men like their fathers. This is not the case when it comes to my dad, husband, and road trips. 1. The vehicle is traveling under the power of the final fuel fumes. 2. The driver’s bladder is about to burst. 3. The driver is suffering starvation-induced hallucinations. Even then, food is purchased in the drive-thru lane, unless rules one and two apply. Dad and my sister, Jerri, once made it to Scottsbluff, NE from Memphis, TN in 17.5 hours. Their record progress was slowed only when Jerri, an honor graduate of the R.G. Greenly School of Cross-Country Speed Racing, was pulled over by a Nebraska State Trooper wishing to remind her of loved ones waiting at home. My husband, however, tends to point his truck in the opposite direction and figure, “I’ll get there eventually.” He does not believe a Rand McNally sponsored map reading course falls into the theology department – he has been known to require 23 hours to cross Missouri. I have a friend who manages to make it to Oklahoma City, OK from Henderson, TN in about nine and a half hours. It recently took us 12 ½ hours just to cross Arkansas. After 20-some years of traveling the nation with my father, I can travel hundreds of miles without a bathroom break, sleep in an upright position, and pack 900 items in a space designed for 10. After only six years of “road tripping” with my husband, I am still driven by the need to beat Dad’s Memphis to Scottsbluff record. But very slowly, I am learning to appreciate actually stopping to take a picture, browse through a craft shop, or eat in a sit-down restaurant. My Heavenly Father has a different approach to traveling life’s highway. We do not need to put our trust in Rand McNally or pack those 900 items around. God promises to lead us in our travels and provide for us along the way. In each of the four gospels, Jesus tells his disciples “take no bag for the journey, or extra tunic, or sandals or a staff.” We don’t need to supply the stuff. God will meet our every need, and if we’ll listen, through His leading, we’ll get there eventually. For three days I kept a positive attitude. I remained calm and just went with the flow. After all, nothing was going to change by getting upset. By the time I finally got on the plane to Dublin, I just wanted to put on my headphones and watch a movie. But we had yet another delay and kept waiting to actually take off. So the lady next to me started chatting. Turns out she’s from Dublin and was curious to know where I was headed. I’m glad she asked, because she gave me a little lesson about my final destination for the week. “Teac Jack,” I responded, pronouncing the first part like a type of wood – teak. She was completely confused. I spelled it for her. “T-e-c?” she asked with wrinkled brow. But I had said it completely wrong. She repeated the correct pronunciation several times but this time my brow was wrinkled. Finally she said it again and asked me to repeat it after her. “Yes,” she smiled and nodded. Since arriving I’ve heard it pronounced like shack (makes sense to me if it means house) and chock (like chalk only without the l) and chack (rhyming with Jack). I ate breakfast, wrote a blog post, wandered around the Dublin Airport, nearly fell asleep, got a coffee, and finally passed the seven-hour layover to board the plane to Donegal. I don’t remember the flight. I was asleep as soon as my seatbelt was fastened, praying during any awake moments that my bag would be at the terminal when I arrived. Fortunately I had a cab waiting for me, who got me to Teac Jack straight away. Well, actually not so straight. I should have sat up front. The car sickness nearly overtook me as we drove at what felt like break-neck speeds on narrow, winding roads. But she screeched to a stop in front of the same three story, soft yellow stucco building I’d seen on the website. At least I knew I was in the right place. I paid the driver 25 euro and headed up the steps to the double wooden door entry. As soon as I said my name to the ladies at the front desk, they knew who I was. I filled them in on the story, got my key, took the lift to the second floor, and hurriedly found my room through the tears threatening to spill over. As soon as I stepped inside, it was all over! I was done. Done looking for the lemonade. Done looking for how to sweeten that sour, bitter liquid that had been the past three days. Done waiting to see how God will use all this for good. Done wearing the same yoga pants, sports bra, sleeveless sport shirt and long-sleeved shirt purchased in the Savannah airport. I flopped down on the bed and thought it was too bad my kids couldn’t have come. There’s enough room for all of them in here. A bunk bed for Geoff and Jeanna, a double bed for Michael and Alyssa, a small twin next to the wall for 19-month old Riley, and a twin across the room and next to the bathroom for me. But since they couldn’t come, I sprawl diagonally across the double bed and weep. As I’m drying my tears, I hear a knock at the door. I toss the tissue into the tiny plastic receptacle in the bathroom and cautiously open the door. One of the ladies from downstairs hands me a bag of clothes. Once again I burst into tears. The next thing I knew I was being wrapped up into a big hug. Perhaps there is a little sugar for this lemonade after all.